PLEASE NOTE: The Thalassiosira pseudonana genome sequence is composed of "finished chromosomes" (Thaps3) and "unmapped sequence" (Thaps3_bd), which were annotated separately. Please use both portals to make a complete analysis of the genome. Diatoms are eukaryotic, photosynthetic microorganisms found throughout marine and freshwater ecosystems and are responsible for as much as 20% of global primary productivity. 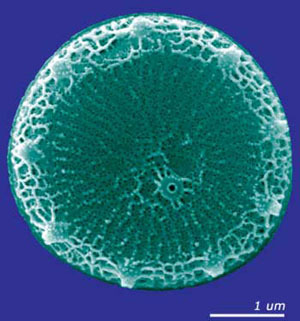 A defining feature of diatom is their ornately patterned silicified cell wall or frustule, which displays such species-specific fine scale nano-structures that diatoms have long been used to test the resolution of optical microscopes. The marine centric diatom Thalassiosira pseudonana was chosen as the first eukaryotic marine phytoplankton for whole genome sequencing because this species has served as a model for diatom physiology studies, the genus Thalassiosira is cosmopolitan throughout the world's oceans, and the genome is relatively small at 34 mega base pairs. The clone of T. pseudonana that was sequenced is CCMP 1335 and is available from the Center for Culture of Marine Phytoplankton. This clone was collected in 1958 from Moriches Bay (Long Island, New York) and has been maintained continuously in culture. The complete T. pseudonana genome sequence will provide a foundation for interpreting the ecological success of these organisms.